The entire team at Salon Vanity wishes you and yours a very Happy Father’s Day. In honor of all of the amazing dads out there, we would like to extend a special offer available through June 18th. Anyone who visits the salon to purchase a gift card of $50 or more will receive a FREE bottle of Layrite® Grooming Spray*. This spray creates a dry style that wonʼt leave your hair feeling overly stiff or crispy. Layrite Grooming Spray is a light grooming spray, used to add a bit volume during the drying process. Again we’d like to say thank you to all of the amazing dads out there, we hope you enjoy your day! Salon Vanity is a Philadelphia Salon located on the corners of 17th and Walnut in Rittenhouse Square. Want more gorgeous? Stay up to date with all things hair by following us on social media! * This promotion is no way sponsored by, endorsed by or affiliated with Layrite®. Must purchase a gift card in-store valued at $50.00 USD or more in order to receive promotional gift (8 oz. 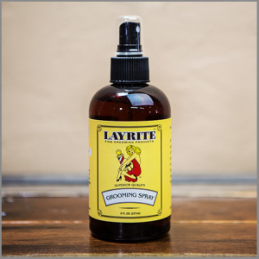 bottle of Layrite® Grooming Spray). Gift cannot be exchanged for cash.